2 Jalan P5/5 Precinct 5, Putrajaya. THE Village Pullman Hotel and Resorts is not a place to go to for a quick bite. It is a place to savour a meal leisurely while enjoying the ambience. Recently, I was there to sample the lamb shank, which is the current promotion. The breezy weather made the dining experience more special, especially when the table was set on the wide front porch overlooking the Putrajaya Lake across the Putrajaya Water Sports Complex. The traditional attap roof of The Village also sets the mood for a relaxing evening to sample the Lamb Shank by sous chef Firdaus Ismail. He takes pride in the dishes he concocts for promotions. ?I have offered my lamb shank recipe at all the hotels that I have worked in,? said the Penang-born chef who has 16 years experience working at prestigious hotels nationwide. 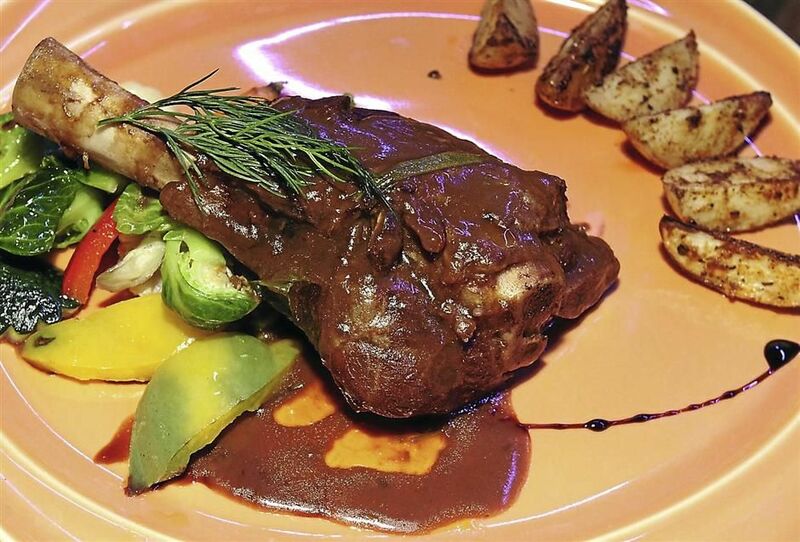 Chef Firdaus said his method of preparing the lamb shank was somewhat different and original. His is almost fusion as he marinates the lamb using local and Western herbs. His late grandfather and father Ismail Muhammad, who used to operate a nasi kandar restaurant in Jelutong, handed down the recipe to him. Chef Firdaus? secret to a delicious lamb shank lies in the home-made brown sauce which, among other things, includes a mixture of coriander, cinnamon, cumin and herbs like rosemary and thyme. ?You have to strike the right balance when using the spices and herbs, otherwise the taste is a little overpowering, ? said the 36-year-old cook who has served Pullman Hotel for the last four years. He started out as an assistant cook at the Shangri-La Rasa Sayang in Penang and worked for four years before moving to Parkroyal Penang for four years, followed by another year with City Bayview Penang before coming to Kuala Lumpur. Chef Firdaus said his mushroom soup was also popular among regular customers, and as such decided to include it as the starter for the Lamb Shank promotion. The Wild Mushroom Soup with truffle oil, with crispy garlic panini on the side, was indeed an absolute killer. The winning taste was a result of three types of mushroom used ? shitake, button and inoki. The porcini dust or imported dried mushroom with truffle oil is the ingredient that added the extra zing to the creamy soup. ?The truffle oil gives a flavourful punch and makes a lot of difference to the mushroom soup,? said chef Firdaus. Even the buns came with specially-made butter, comprising dill, parsley, garlic and porcini mushroom dust. The lamb shank was nicely seasoned and braised overnight with some herbs, which brought out the sweetness of the meat. ?I normally use homemade stock to marinate the lamb. The sauce is prepared separately and is thick enough to soak the lamb shank in it. ?It is important to cook it slowly to ensure the meat is tender and juicy. The whole process will take some time,? said chef Firdaus who is the fourth among six siblings. The braised lamb shank was served with baby potatoes, cabbage, carrots and a mix of vegetables. Diners can opt for a generous splash of au jus gravy if preferred. For dessert, three-layered moist Almond Pear Chocolate Cake was served. The chocolate ganache is not too sweet and of the right texture. We had this with piping hot coffee served by the restaurant manager Hafiz Rahman. The three-course dinner, priced at RM125 ++, was truly satisfying and filling.